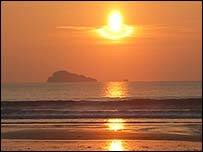 If you wanted to splash out on a holiday in the lap of luxury, would Wales immediately spring to mind? Maybe not. But tourism officials hope to change that with a new drive to let the world know that Wales has splendour to spare for the discerning traveller. They admit that many higher-spending holidaymakers still believe that Wales is more suited to traditional family bucket-and-spade breaks. But as Wales launches its campaign, is it ready to pamper its visitors? Gill Berntsen thinks so. She is the Wales Tourist Board's head of UK marketing, and said she was confident the nation had "the right product" to target the luxury market. The board has awarded a two-year £150,000 contract to attract top-dollar visitors focusing on everything from "selected hotels" to "chic B&Bs," with the emphasis on those providing a "highly personalised" service. Ms Berntsen said the campaign would also be based on a mixture of specific places to stay and general attractions, from beaches and countryside, to galleries and art exhibitions or golf. The board is reluctant at this stage to identify individual hotels which could be highlighted, but they could include the likes of the St David's in Cardiff, Hotel Portmeirion on the north-west coast, and Bodysgallen Hall, Llandudno. A good starting point could also be Welsh Rarebits, a group formed in the mid-1980s to represent "the best places to stay in Wales." Emyr Griffith founded Welsh Rarebits, which now has 46 members. He unsuccessfully bid for the new contract - won by Designate Communications - but said he was pleased that "more is to be done to highlight the top end of the market". However, Mr Griffith does not like the term "luxury" in this sense, arguing that many tourists, and younger ones in particular, are looking instead for a "lifestyle". "Twenty years ago Wales was thought of as a caravan holiday, self-catering destination, but now I believe that we have a quality product. "I don't have to tell you what's happened in Cardiff over the past five years, but I've concentrated on what's gone on outside, and on privately-owned properties rather than on chains." The Lamphey Court Hotel in Pembrokeshire is a member of Welsh Rarebits, and its deputy manager Ian Mansell said some people were still "in denial" about the availability of leisure in luxury in Wales. But he said: "If people want to find them they will. It depends to what extent they do." Mr Mansell said the hotel was able to use attractions such as its leisure centre and nearby golf course, while another key element in appealing to the luxury market were its beauty packages. "We have a lot of visitors from within Wales: a lot from south Wales and the Midlands and London, but not many from the north of England," said Mr Mansell. 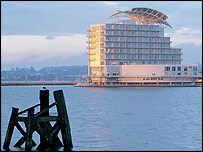 Prof David Botterill, of the Welsh School of Tourism at the University of Wales Institute, Cardiff, agreed that the perception remained that Wales was not high in providing luxury. But Prof Botterill believes Wales' appeal to the top end of the market lies not just in its accommodation, but also in the "luxury" of its natural surroundings: clean air, beaches, mountains and so on. "The whole environmental quality issue is becoming much more valued," he said. "It's the sense than luxury breaks are drawing on the high quality of the environment, and consumers are recognising that these are to be found in Wales." As a personal choice of luxury destination, Prof Botterill recommends Portmeirion, the eccentric Italianate village still benefiting from its cult status as the setting of the 1960s TV series The Prisoner. 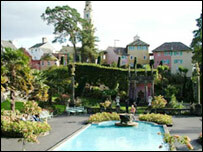 "Portmeirion is amazing: the concept of the village and the quality and standards, and it's incredibly popular."